Hazelnut Oil: What Is it and Why Should You Use it? When it comes to natural health and well-being, there are so many resources available to us that can help bring us back to our roots, promoting good health through natural ingredients instead of man-made chemical ones. As these natural substances are gaining more and more attention, people around the world are beginning to join the natural health craze; many businesses and influential people are devoting their time to natural and holistic health or beauty. With all of the attention being given to natural products lately, it’s becoming easier and easier to get your hands on substances that can be added to your daily natural care routines. Of course, some substances, such as the ones made from ingredients with which we are already familiar, are much easier to come by than others. If you would like to find out more about the benefits of hazelnut oil, read on. Hazelnut oil is a very popular natural substance due to the majority of society’s familiarity with the nut that it comes from, the hazelnut. In fact, many people might often enjoy the regular hazelnut as a healthy snack or as an added flavor to their coffee or toast, thanks to a chocolate spread that significantly popularized the ingredient. Generally speaking, hazelnuts are extremely nutritious, packed full of many essential proteins, vitamins, and fats. It is the high concentration of fats that allows us to extract a healthy oil from the nuts, providing many benefits for people regardless of how they choose to use it. When it comes to hazelnuts, we have seen them used in many ways. The kernels of the nuts can be eaten raw but they are also often roasted for a richer flavor and aroma. The nuts might also be minced, chopped, made into a powder, or even ground into a paste, depending on any person’s personal preference. Because of the nut’s extreme versatility, it has been used in many different food products for quite some time now and you probably might not have even realized how many things the ingredient has been present in. The oil that is extracted from the fats of the nut is also very versatile and can be used in everything from cooking to skin and hair care routines. Hazelnuts grow on the hazel tree, scientifically or botanically named Corylus, and are often otherwise referred to as cobnuts or filbert nuts. The hazel tree, Corylus, is native to the world’s Northern Hemisphere and you can recognize it by its rounded leaves with edges that are serrated as well as the small, pale flowers of yellow or red that can be found blooming in the spring season. The nuts that we know as hazelnuts grow in husks on the hazel tree and fall out about seven to eight months after they have been pollinated, which is the time when they are ripe. Hazelnut oil can be extracted using several different methods and the choice of extraction method will have a significant effect on the quality of the oil and how it turns out. Generally speaking, it is always best to purchase organic oils that have not been processed or have been processed as little as possible as processing can dilute and reduce the nutrients that are present in the oil, making it far less effective. Roasted hazelnut oil is extracted by pressing hazelnuts that have been lightly roasted and this extraction method generally keeps the strongest aroma and flavor present in the oil. Cold-pressed oils are of similar quality and have been extracted without using heat during the process, which helps keep all of the oil’s natural nutrients in place. Try to avoid refined oils as these have been extracted using a chemical process that actually reduces the amount of nutrients present in the oil. Hazelnut oil is a fantastic carrier oil, which is a vegetable oil pressed from seeds or kernels in the fatty parts of plants. In comparison to other oils that you might be familiar with, such as essential oils, carrier oils are true oils; on the other hand, essential oils are actually just liquid compounds that are volatile. Carrier oils are great for use when applying other, stronger essential oils that may be too harsh to apply directly to your skin; by mixing those oils with a carrier oil, the essential oil will last longer and will be far less likely to irritate your skin. Other popular carrier oils include avocado oil, almond oil, grapeseed oil and jojoba oil. While olive oil could be used as a carrier oil, it is generally not recommended due to its heavy thickness and strong smell. A comedogenic rating is given to natural substances such as oils, minerals, waxes, and many others to give a person a good idea regarding whether or not that substance is likely to irritate the skin or clog the pores after being used. Comedogenic ratings are given on a scale ranging from zero to five and the lowest numbers represent substances, dubbed as non-comedogenic, that are highly unlikely to irritate any person’s skin, regardless of skin type. Of course, these ratings should only be taken as general words of advice when trying to decide what natural substances you should add to your skincare routine as every person’s skin is different and some may not react the way others’ do. Carrier oils such as hazelnut oil are typically rated very low on the comedogenic scale as their purpose means that they should be suitable for use on any skin type to dilute stronger, harsher essential oils and make them more suitable for use on sensitive skin. Hazelnut oil follows this pattern with a comedogenic rating of zero, which means that generally speaking, no person should have a bad reaction to the use of this oil. Of course, it is still best to do a small patch test to make sure, especially if you know that your skin is prone to having reactions to the use of oils and other substances. As with every nut, hazelnuts and other nuts are very healthy due to their high concentration of healthy fats and proteins. Hazelnuts are particularly good sources of other nutrients as well, including Vitamin E, Vitamin B, and oleic acid. When ingested, the nuts also provide a very healthy source of dietary fiber, which can help promote a healthier digestive system and also supply a good fraction of your daily folate requirement in just one serving. On top of those healthy nutrients, hazelnuts also provide a large amount of flavonoids, which have been proven to reduce the risk of heart attacks and strokes. These healthy flavonoids, which include catechins and tannins, give the oil a lighter and drier feeling to help smooth and tone the skin while applying. The nutritious properties of these flavonoids help minimize your pores and balance the oils of your skin, which can be incredibly beneficial to people who suffer from oily skin. The use of hazelnut oil provides many other benefits as well. While the oil is great for balancing oily skin, it still provides a healthy amount of hydration for all skin types. It also has very powerful antioxidant, antibacterial, and astringent properties that can help heal damaged skin and make the tissue firm again. When used on the hair, the oil can help heal damaged hair and also help keep your hair untangles and keep the frizz under control. Hazelnut oil is generally regarded as a safe option for people with skin sensitivities. Although hazelnut oil has natural astringent properties, it does not contain the alcohol that many commercial astringents contain. Alcohol based astringent formulas tend to be harsh and can irritate and dry out the skin. Hazelnut oil can offer all the benefits of commercial astringents without the adverse side effects. Hazelnut oil can help boost the body’s production of collagen – an essential protein which helps hold the organs, bones and the tendons tendons together. Not only that but collagen also gives your skin its elasticity and structure. Hazelnut oil is very effective at hydrating the skin. Its high content of vitamin E and fatty acids help boost hydration in the outer layers of your skin. By keeping your skin well-hydrated, it also helps to boost the skin’s elasticity. This keeps your skin looking firm, healthy and supple. The vitamin E and the various fatty acids found in hazelnut oil also make the oil a very effective, natural moisturizer. When applied topically to the skin, these nutrients help produce a natural barrier helping to seal in the moisture and preventing your skin from drying out. As we have already mentioned, hazelnut oil can be used as a natural astringent. The tannins found in hazelnut oil are both potent antioxidants and natural astringents. Astringent oils like hazelnut can help cleanse and tighten the skin, shrink the pores and eradicate bacteria. This means your skin is less likely to develop common conditions like acne and can also help reduce the appearance of wrinkles. Another potential benefits of oils rich in vitamin E is their effect on scars. Several studies have been done into the effects of the vitamin on diminishing the appearance of scars but the research to date has been inconclusive. Hazelnut oil is a rich source of vitamin E which is a powerful antioxidant. Antioxidants like vitamin E can help protect the skin from the damaging effects of free radicals and prevent many of the signs of premature aging. Hyperpgmentation is a skin condition which causes the skin to become darker. It can effect small areas or larger parts of the skin. The condition can be caused by various factors including acne, sun damage, pregnancy and injury. Being such a good source of vitamin E, it is possible that hazelnut oil can help. There is some evidence that vitamin E can help reduce hyperpigmentation but the findings so far are inconclusive. 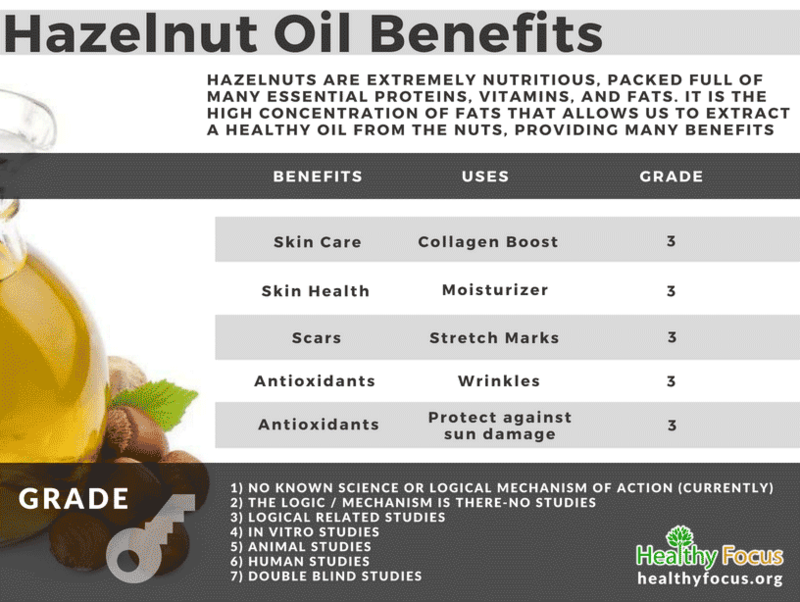 How Can Hazelnut Oil Be Used? Because of how incredibly beneficial and versatile hazelnut oil is, it is used in many different products. Thanks to its sweet taste, it is very popularly used in cooking, especially in salad dressings and vinaigrettes. 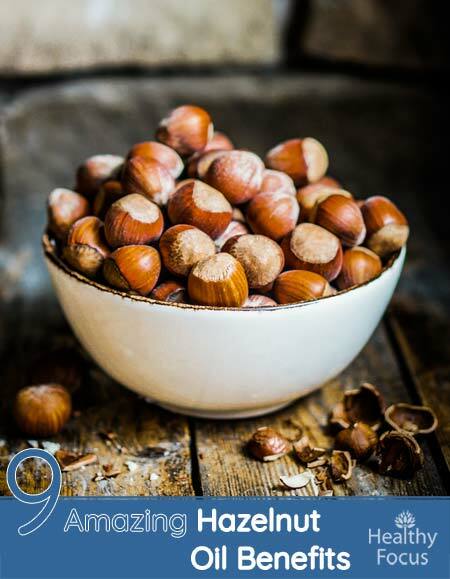 Because hazelnut is a great carrier oil as well as a fantastic source of lubrication and skin softening, it is also commonly used in massage therapy. At home, you can use it to make skin creams and lotions by mixing a few drops of it in with your favorite moisturizer. Hazelnut oil lasts a long time in storage, thanks to its high concentration of Vitamin E, and is very slow to turn rancid, unlike some other oils. If your hazelnut oil was extracted using a cold-press method, it’s typically best to store it in a dark, cool place in between uses. You might also refrigerate your oil but be sure to bring it back to room temperature before using, which can be done by soaking the bottle in a warm-water bath. The topical use of hazelnut oil is generally regarded as safe. People with allergies to nuts should avoid using hazelnut oil. To make sure you are not sensitive to the oil, it is good practice to perform a patch test on a discrete area of skin before applying a larger dose. Hazelnuts deserve far more attention than they currently get and that’s saying something considering how popular they are right now. Many people only appreciate the powerful nut for its great taste and smell, rather than all of the significant health benefits it can offer when used in the right ways. Adding this oil to your daily skin or hair care routines or even using it in your cooking recipes is a great way to bring your skin back to natural health.